What happens if I’m late for a performance? Patrons arriving after curtain time may not be able to enter until the next available entrance time. Performances may be viewed on the monitors in the lobby until this entrance time. Please note that the box office/will call closes 30 minutes into the show. Tickets may not be available after this time. What is a McCaw Hall emergency contact number that I can leave with my babysitter when I attend a performance? Inform those who may need to reach you in an emergency to call 206-733-9722. Leave your section, row and seat number with your babysitter so you can be identified. Is there a dress codes for attending McCaw Hall events? McCaw Hall is your performing arts center and we want you to feel most welcome regardless of wardrobe. The type of event, for example a rock concert vs. an opera performance, is often the best indicator of what you might feel is the most appropriate wear. Men wear everything from casual slacks with a button down shirt and jacket to jeans and a polo shirt or t-shirt. Some men even prefer wearing a suit for Opera or Ballet performances. Attire for women varies from dresses and skirts to slacks and jeans. Regardless of your choice, we want you to feel comfortable enough to truly enjoy your experience. As in most establishments, shirts and shoes are required at all times. Where can I make a comment about my experience at McCaw Hall? We welcome your feedback. Fill out our Contact Us form to send us a comment or ask a question. McCaw Hall inner lobby is open 2.5 hours before performance start time. The auditorium doors generally open 30 minutes before performance start time. We do encourage you to arrive early and enjoy the pre-show discussions prior to Opera or Ballet performances as well as any of our dining options. Are there dining options in McCaw Hall? Absolutely! We have a variety of dining options available during most performances. Please visit Dining at McCaw Hall for a list of dining options, including our in-house restaurant Prelude and concession stands. What does Prelude restaurant serve on any given night? The menu at Prelude changes frequently. Dining at McCaw Hall has the most up-to-date menus. There are several parking garages and street parking available around McCaw Hall. Details and directions are listed in Parking. What are alternative methods of transportation to get to McCaw Hall? McCaw Hall is accessible by various types of public transportation, including bus and the Seattle Center Monorail. Visit Getting Here for further information. Am I permitted to record or photograph a performance in the theater? Video and/or audio taping is prohibited during all performances. Cameras, including those on cell phones, are not permitted. What if I have an emergency while watching a performance? Contact the nearest usher staff person for assistance. Our staff will assess the situation and take the necessary steps to assist with your particular emergency. If you lose an item while attending an event, please inquire with any of the usher staff or House Manager for assistance locating the item. Is there any special etiquette that I should adhere to when attending a performance or event? Silence or turn off devices that make noise or emit light; this includes cell phones, wristwatches and any other electronic devices. Minimize noisy disruptions such as talking or rustling programs. Unwrap all candies and cough drops before the lights dim or at intermission. Please use moderation in applying perfume, cologne, or scented lotion as many people are highly allergic to perfumes. Please feel free to call 206-733-9725 for more specific advice about a particular show. 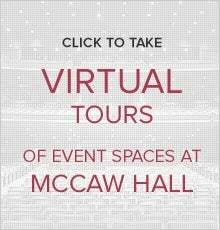 How can I sign up for McCaw Hall's Email Newsletter or Eblasts? At the top of the page, select the icon that looks like an envelope. You can also sign up by clicking here. 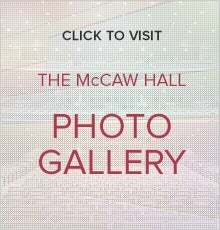 Where can I find a map that shows McCaw Hall on the Seattle Center campus? You can find a map by clicking here. As a part of Seattle Center, McCaw Hall first follows Seattle Center's Campus Rules regarding prohibited or restricted items. You can read the rules by clicking here. Additionally, depending on the event, there may be additional rules in place for safety or other concerns. These rules can vary from requiring no bags in the seating area to requiring no cameras. Yes, McCaw Hall is ADA compliant. You can read more about our various accommodations here. If you have a specific disability access need, please tell the box office when purchasing your tickets. McCaw Hall holds special needs seats as long as possible for our ADA patrons; however, if a show nears selling out, these seats are released for general sale. I would like to have my company meeting at McCaw Hall. Do you have banquet or meeting facilities? Yes! Our private rooms as well as our spacious lobbies are available for rent and feature professional catering by Spectra Food Services & Hospitality. Please call 206-684-7103 or visit Plan Your Event for more information. Do you rent the theaters for events such as weddings, graduations or parties? Yes! Our beautiful theaters are the perfect setting for weddings, wedding photography, graduations, business meetings, receptions and even movie shoots! We can customize an event to suit your every need. Please call 206-684-7103 or visit Plan Your Event for more information.